The gripping story of six West Point graduates-including George Armstrong Custer-who fought each other in the Civil War. With Civil War storm clouds darkening the horizon, they were strangers from different states thrown together as West Point cadets: George Armstrong Custer, Stephen Dodson Ramseur, Henry Algernon DuPont, John Pelham, Thomas Lafayette Rosser, and Wesley Merritt. Educated and trained there to be not only officers and gentlemen but also courageous battlefield leaders, their shared experience at West Point forged bonds between them stronger than brotherhood. Right after their graduations, war erupted in 1861. They stayed blue or went gray, and even faced each other in battle. Acclaimed military historian Tom Carhart brings to life the human side of valiant victories and crushing defeats, and, most vividly, of these young men of individual valor and personal honor. 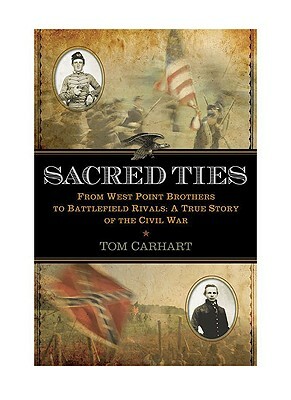 Tom Carhart has been a lawyer and a historian for the Department of the Army in Washington, D.C. He is a graduate of West Point, a decorated Vietnam veteran, and has earned a Ph.D. in American and military history from Princeton University. He is the author of four books of military history and teaches at Mary Washington College near his home in the Washington, D.C. area. "Sheds new light on the grandest battle of the Civil War, a remarkable achievement by any military historian"
"Bold and provocative...sure to stimulate debate among even the most seasoned Civil War buffs." "Thanks to Tom Carhart's painstaking and absorbing reconstruction of events, we now have a clear comprehension of what Lee planned for July 3-and why it went wrong... Given the vast number of writings on Gettysburg, it seems impossible to come up with new information and insights about the battle. But Tom Carhart has done it." "Tom Carhart's Lost Triumph is, amazingly, a new, original and important contribution to our understanding of the Battle of Gettysburg." "Not only a fine work of scholarship but a fine story." "Provocative and exciting. A very good read." "An exciting, wonderful book rivaling anything yet written about the battle of Gettysburg. It is mandatory reading for Civil War buffs"
"A mark of true genius is a writer's ability to show us the familiar in a new light. Carhart does just that in Lost Triumph ... truly a ground-breaking contribution to American military history." "With Lost Triumph, Carhart swats a stupendous, historical, out-of-the- park four-bagger. History is seldom page-turning; here, the true events of Gettysburg compose a thriller."